1. Wedding invitation etiquette still strongly stands for paper wedding invitations. The effort put into choosing an invitation, assembling them, addressing them and mailing them is equivalent to a personal invitation straight from the mouth of the bride or the groom. Invitations are an honor to receive and a joy to set on the mantel or post on the fridge until the happy day. 2. Not everyone is ready to make the leap to electronic wedding invitations. Older wedding guests or the less technologically savvy may not have the means or the desire to receive an invitation via email. Not to mention the more traditional guests judging your decision to go electronic. Both problems can be addressed with just a few physical invitations or ignored because you know what you want and what’s right for the two of you. 3. Following tradition is important to many brides and grooms. 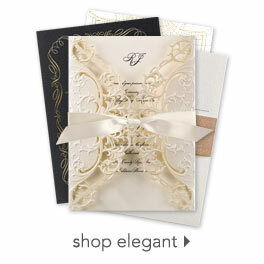 The value of paper wedding invitations isn’t in the physical invitation itself, it’s in the elegance of the tradition. Everyone enjoys receiving a hand-addressed invitation, and weddings are the one event where friends and family can count on getting an actual invitation in the mail. Almost all other occasions and events have made way for electronic invitations but weddings have remained special, as they should. We’re not going to preach in favor of paper wedding invitations and ignore the value of its electronic counterpart. First of all, electronic wedding invitations are cheap. Secondly, there is no assembly and the ease of sending is pretty much unbeatable. Lastly, the designs have become quite beautiful and one website in particular, Paperless Post, has really enhanced the presentation. If you’re on the fence about electronic wedding invitations, head on over to Slate Magazine and read this article, Click Here to RSVP. You will find the case for electronic wedding invitations is an easy one to make but a tough one to sell. In the end, you might just find the joy of sending a beautifully addressed envelope and invitation outweighs the practicality of going electronic.